July is normally a good month for an angler. The rivers aren’t always at their best, with low water levels and bright sunshine, while many of the fish remain more interested in one another than they are in eating. The long days give us plenty of time though, and sultry summer evenings can offer some of the best fishing of the season. 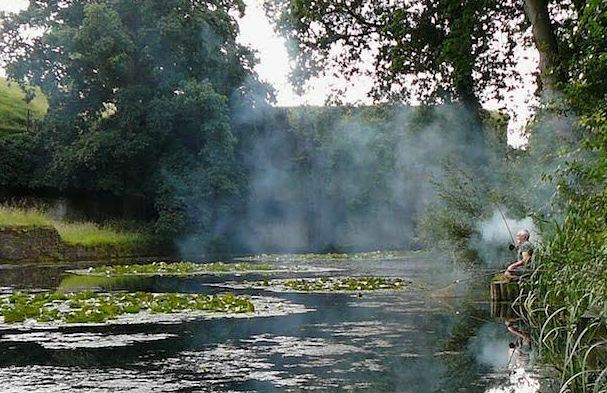 It can seem strange to finish work and reach for a rod, but nothing interrupts the stress of the 9 to 5 than a few hours beside a steaming little tench pond. Unfortunately, time has not been my friend this summer, and I’ve only managed one such trip so far. I joined Chris for an evening at a little pond in Wiltshire which I had fished before as his guest but not for some years. It is a lovely, old piece of water. Maintained but not over managed. Showers had been promised but we arrived to find sun on the water and a stiff breeze buffeting the lily pads. I changed my mind a couple of times about where to cast, and by the time I had settled, Chris had already caught a crucian of 1lb 10oz. My swim was tight into my own bank, my float nestled in a small gap in the lilies. It took a while to get the fish fizzing, but once they did I caught four nice crucians and a spirited little tench. Though the fish were welcome, the most exciting aspect of the evening was watching the bubbles around my float. It is, for me at least, one of the very best things about summer fishing. And while it can be infuriating to watch a motionless float with bubbles fizzing all around it, the intensity is gloriously addictive. Earlier in the month I had the pleasure of fishing another water where for much of the day, the bubbles were the only sign that fish even existed. The Moat is one of the most extraordinary waters I have ever visited. In an old naval town, deep in a mish-mash of 21st Century decay and momentous maritime history is a deep, clear, weed-choked piece of water where specimen fish of many species lurk. I was hoping for a crucian, with a tench or two for good measure. The day itself was something of a social affair, with a dozen or so like-minded souls lined up with an array of different tackle and methods and plenty of banter thrown in. I had fished the Moat last year, and having had some success opted to fish the same swim. It took a little while before there was any bubbling, but with a couple of fish feeding I was struggling to get a bait to them. The bottom was thick with silkweed, and it was proving almost impossible to get a bait through it. Fortunately, Steve in the next peg had had the sense to run a rake through his own swim, and having done the same, I put some more feed in and lit the kettle while I waited for the water to settle. The response was almost immediate, and long before the kettle boiled I had a crucian in the net. It was a high backed fish with deep mahogany flanks, approaching two pounds in weight but not close enough for me to reach for the scales to check. Despite further chances, and a couple of tench lost in the weed, that proved to be my only fish of the day. The bright sunshine didn’t help matters, but more of an impact was the presence of so many anglers (introducing plenty of bait) on a usually unpressured water. It didn’t matter though, it was enough to acquaint and reacquaint with some lovely people. With my busy diary and (eternally) limited finances, those two trips were the limit of my coarse fishing in July. I did, however, manage a couple of hours on Chesil. My wife, Sue, and I live seven miles (by road) from the sea, and though we don’t spend as much time on the pebbles as we thought we might when we moved here, we never fail to feel soothed whenever we nip down to the coast. Anglers fish Chesil Beach in huge numbers, often just yards apart, especially in the summer when the caravan parks and campsites are filled with holiday makers. The main draw is the mackerel. There are shoals all along the coast, and they can turn up regardless of the tide, but when the whitebait shoals move inshore it can get really silly. The mackerel will chase the whitebait right into the wash of the waves, sometimes beaching themselves in the process. Fishing then is no longer fun, though plenty of people take advantage of the plunder—filling buckets and bags with more fish then they will ever likely eat. My couple of trips (an hour or so or each occasion) came when the whitebait were still way out west, and the mackerel were scattered. The first visit saw very little action. In fact, no-one within sight had a sniff of a fish, and with my last couple of casts I tried something different. Rather than the big booming cast and dramatic sweeps of the rod, I let the feathers hit bottom and then inched them back, trusting the flooding tide to sparkle them into life. 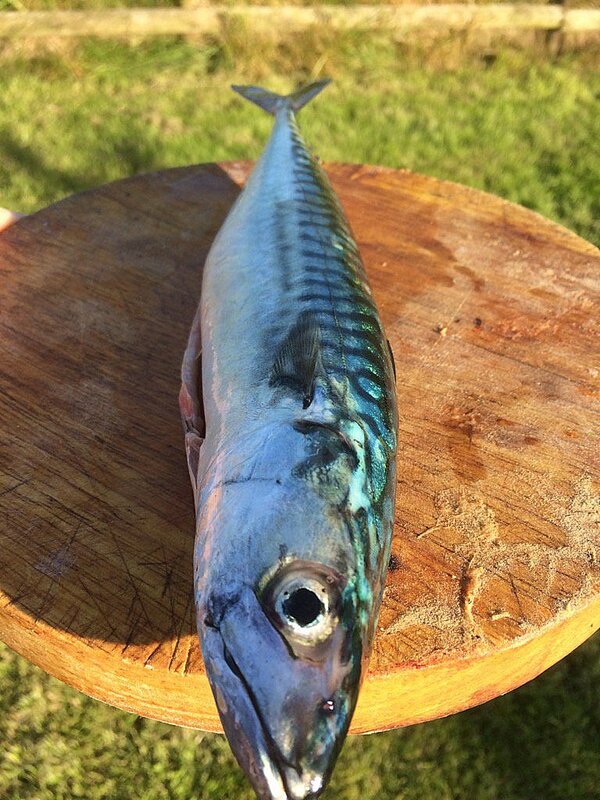 It worked, and a single mackerel saved a blank and gave me food for thought the following week.